Leather-bound compendium contains material from John Eckhardt's best-selling series. This special edition combines message fromPrayers That Release Heaven on EarthandPrayers That Move Mountains. Prayers That Release Heaven on Earthis a handbook for advancing the kingdom of God here and now. Combining powerful prayers with decrees taken from Scripture, it helps you understand God's plan and keeps your heart and mind focused on Him. Prayers That Move Mountainsis filled with prayers of submission, repentance, confession, obedience, praise, and worship. Based on 2 Chronicles 7:14-15. About "Prayers That Release Heaven and Move Mountains"
Customer Reviews For "Prayers That Release Heaven and Move Mountains"
I cannot recommend this book highly enough. It has challenged, broken and changed the way I pray forever. 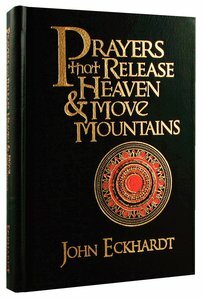 John Eckhardt is an amazing man of God to write such a beautiful insight into a deeper prayer life.